Sarah, a 43-year-old brunette with the tan, toned arms of a longtime equestrian, was visibly frustrated. She had hit a disappointing roadblock in her training. Despite working with a respected dressage instructor, Sarah was beginning to feel as if her imported warmblood would never do well in dressage. Her horse, an eight-year-old Dutch warmblood named Ace, had lovely conformation and an impressive pedigree. Generally easy-going and amiable, the bay gelding became tense whenever a rider asked for any degree of collection. A tenacious researcher, Sarah had already explored medical, diet, training, turnout and saddle-related reasons that could prevent a horse from rounding his back and engaging his hindquarters. But despite all her expensive efforts, her horse was getting more resistant. She constantly worried that his back might be sore and tight. No wonder Sarah was frustrated! When Sarah heard about my work, she figured that one more opinion couldn’t hurt. And less than five minutes after I met Ace, I gave Sarah the missing piece of her puzzle. This doesn’t mean that the problem disappeared in five minutes. Not at all. It’s just that I had discovered a viable reason for her horse’s issues. And, most importantly, I had a plan for improvement. Click here to get the secret to rounding the back. After meeting Ace, I used my hands to gently explore the warmblood’s body. In doing so, I noticed that his sternum and ribs were restricted in their movement. Such limitation in the rib cage would make it difficult for the gelding to lift his withers, round his back and engage his hind legs. No wonder Sarah and Ace couldn’t advance in their training! When a horse achieves collection, his withers rise up and his croup lowers and tucks. His back is round, lifted and supple. His hindquarters are underneath him and are powerfully engaged. 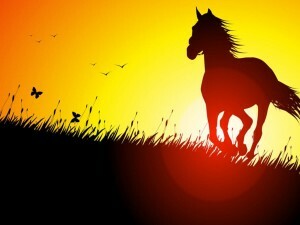 To attain this, the horse’s sternum and ribs come up and back a bit, bringing his sternum and pelvis closer together. You see this as a subtle shortening of the underside of the collected horse. But a horse with limited sternal and rib movement will find it difficult for the sternum and pelvis to move toward each other. And since the sternum and spine are connected via the ribs, it will be problematic for the withers to rise, and the horse’s back will be stiff. You can see how challenging it would be for that horse to round his back and engage his hind end! 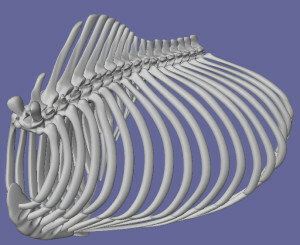 In this illustration of an equine rib cage, it’s easy to see how the sternum and ribs can affect the withers and other parts of the horse’s spine. Horses with stiff, tense backs are often classified as leg movers because their legs are doing most of the work. That creates a lot of wear and tear on joints and muscles and can take a great toll on the horse’s soundness. A horse that moves with a tight, hollowed back can even develop a painful, debilitating condition known as “kissing spines.” Instead of being a leg mover, we wanted Ace to become a back mover. A back mover is relaxed and swings through his back. Such a horse is “through” and his movements have an elegant elasticity to them. Since the horse’s whole body is participating in his movement, there is less strain on muscles, ligaments and joints. 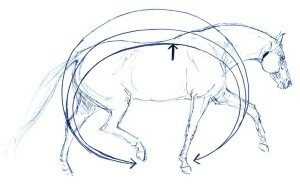 Point to remember: A horse can comfortably round his back and engage his hind end only when his rib cage moves freely. At this point you might be asking: Why would a well-conformed, healthy dressage horse with an expensive, fitted saddle and a sensitive, balanced rider have inadequate movement in his rib cage? We’ll probably never know the actual reason, but I’ll hazard a guess. It’s possible that early in the gelding’s life his trainer had often tightened the girth uncomfortably and/or used an ill-fitting saddle. This can lead to the horse defensively stiffening the muscles of his rib cage to minimize the anticipated pain. And there are many other possible explanations. Ace may have been subjected to a rider who used the reins harshly, sat heavier on one seat bone, or couldn’t sit the trot without bouncing. He might have had a period of unbalanced hoof trimming or a painful dental problem. Any of these could cause a riding horse to stiffen his rib cage and hollow his back to avoid pain. And even though Ace no longer had to defend against pain, stiffening the rib cage had become a habit. Our goal would be to persuade the bay gelding that not only was that habit unnecessary, but he’d be more comfortable if he let those parts move freely. Mary gently checking for the subtle movement of a horse’s sternum. Read on to learn why she did NOT ask the horse to lift his back. First, I asked Sarah to take a break from riding her horse for a few weeks. Ace could still enjoy plenty of turnout and social time. Over the course of several sessions, I helped the gelding discover healthy rib cage movement by gently touching and moving his sternum and ribs in various ways. The intent was to remind his nervous system that these parts could move comfortably and easily. One thing I DIDN’T do was to use pressure along the horse’s midline to get him to lift his back. That’s right. I did NOT press my fingers into the horse’s midline to get him to lift his back. Although this is commonly done, it can have unintended consequences. 1. I may have been able to use finger pressure to get Ace to reflexively contract his abdominals and lift his back. But it’s very possible that lifting his back would be uncomfortable or even painful. And then Ace would associate lifting his back with pain. Definitely not we want! 2. While getting a horse to repeatedly contract his abdominals and lift his back may strengthen particular muscles, it does not teach the horse how to release the restrictions – both mental and muscular – that contributed to his difficulty in the first place. 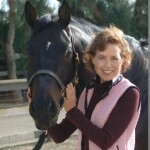 Instead, my aim was to bring the whole horse – body and mind – into the experience, so he could discover a healthier, more athletic way to round his back. And it was important that he associated the movement with pleasure, never with pain. So here’s what I did: I thought about the parts of the horse that help create collection. Then, with my hands, I helped the horse improve each piece. For example, I helped Ace feel how moving his sternum and ribs could lift his withers. And how softening his ribcage relaxed his back. I helped him feel how movement could travel unimpeded through his entire body. Eventually, I put the pieces together to simulate, as best I could, the movement of rounding the back and engaging the hind legs. Soon the gelding discovered that rounding his back was not only possible, but comfortable. This was significant, as it is important to associate movement with pleasure. After all, the brain seeks pleasure and avoids pain. Associating movement with pleasure helps the horse recreate that lovely movement again and again. Points to remember: Avoid using pressure or restraint to force movement to occur, as you may cause discomfort, anxiety and restrictions in your horse. Instead, associate movement with pleasure and choice. Once the warmblood learned to move in this new way, I asked Sarah to gradually add pieces of tack during our sessions. This was also important, because if the habit of immobilizing the rib cage and tensing the back was in reaction to a poorly-fitted saddle or uncomfortable girthing up, the horse would probably revert back to the restriction the next time he saw his saddle. Remember, this is true even if the offending saddle was replaced years ago. Or if you now take your time girthing up your horse. By gently suggesting and supporting comfortable movements of the sternum, ribs and back with the saddle on and while slowly girthing up, I helped the horse overcome the negative association. Mary helps the horse feel how his ribs can move with his rider up. Since Ace also became tense when his rider cued him, I eventually worked with Sarah in the saddle. Again, my idea was to remind the bay horse that he didn’t have to react habitually. I used my hands on his body to suggest softness and freedom each time Sarah used her aids. By moving in a balanced, coordinated way, the warmblood had less stress on his joints and muscles, and he went on to become a willing, supple, and sound dressage horse. Would you like to learn these techniques to help your own horse? Mary Debono travels internationally to offer workshops and clinics to riders of all levels and disciplines. Please visit Mary’s Events page to see if she’s coming to an area near you. Or email Mary@DebonoMoves.com if you’d like more info on how Mary can come to your town. 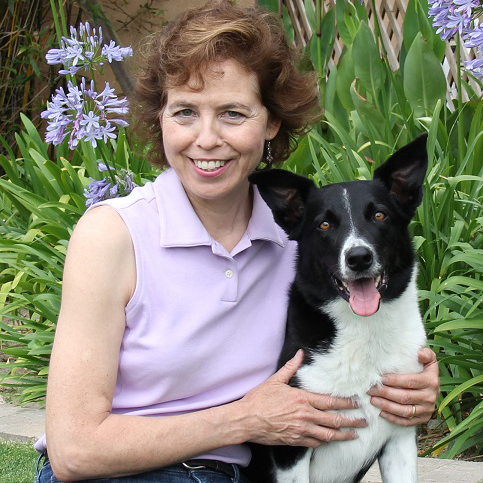 Mary is also available for online consultations and will soon be offering online courses. Would you like to receive educational articles and videos from Mary? Please click here to sign up for our FREE newsletter. Don’t miss out! Is it easy for your horse to round his back? Or is it a struggle? Do you have an issue you’d like me to address in a future post or video? Please let me know! Email info@DebonoMoves.com. This information is for educational purposes only and is not intended to replace veterinary advice. Please consult a veterinarian if you have any concerns about your horse’s health or soundness. Horses are potentially dangerous. Please use caution around them. Mary Debono, Gary Waskowsky and SENSE Method, Inc. disclaim all liability in connection with the use of this information.